Foreword by: John L. Allen, Jr. 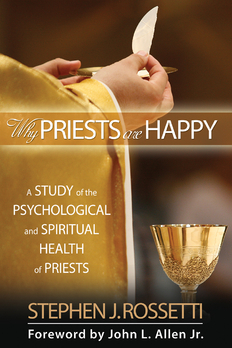 In his groundbreaking Why Priests Are Happy: A Study of the Psychological and Spiritual Health of Priests Msgr. Stephen J. Rossetti, a psychologist, professor of pastoral studies, frequently consulted expert on clergy and religious, and the Best selling author of books for priests, presents the findings from the most comprehensive survey of priests' happiness and spiritual lives ever undertaken. From this survey of nearly 2,500 priests from twenty-three dioceses in the United States, Rossetti discovered that American priests enjoy an extraordinarily high rate of happiness and satisfaction, among the highest of any profession.